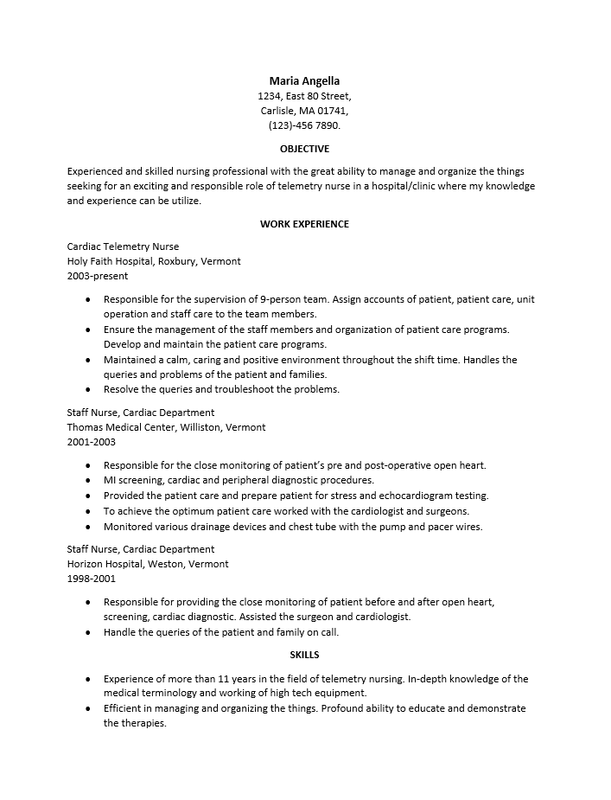 The Telemetry Nurse Resume Template acts as a general guide for those wishing to apply for this position. Telemetry nursing can be very fulfilling for candidates who are experts at monitoring and a keen ability to spot a dangerous situation. Hiring entities will look for a variety of skills and technical expertise in a candidate in order to consider him or her a viable choice for an interview. That is, an applicant must present well from their initial inquiry to the moment of hire. Users wishing to implement a template to write a resume should organize their thoughts and make a brief outline of the content for each section. They should implement technical jargon that is often used in the profession throughout the resume as this will solidify the claims they will make regarding their knowledge base. This is particularly important in terms of telemetry as it will require someone has a top notch understanding all medical monitoring devices and is able to communicate the data perfectly. Well written content coupled with the aesthetics of a keenly designed template can truly increase the chances of attaining an interview with a sought after employment opportunity. Step 1. Your full name and contact information (mailing address, phone, email, etc) should go at the top of the page. Attempt to use an effect to highlight your name, this area will act as a business card of sorts and should look just as refined. Step 2. Compose several statements regarding your intentions and how you perceive your professionalism. Place this in the “Objective” section. Step 3. List everywhere you worked in reverse chronological order. This list will go in the “Work Experience” section and each section will have to be informative. Start by listing the job title you held there, on the next line give the name of the employer and the city/state, and on the next line will be the date range you worked for them. There should also be a description of what you did there while you were employed for them. Step 4. Give a complimentary description of your skill set and experience in the “Skills” section. 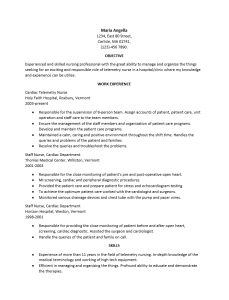 Keep in mind that everything listed here should relate to being a telemetry nurse. Step 5. The “Education” and “Reference” section will list your academic and professional credentials, respectively. If you do not have direct permission to list someone’s contact information in “References” merely state that you have them in a brief statement.